In the first week of the holidays I finally got round to something I’d been wanting to do since I was first here two years ago – visit the town of Chamonix, in the Alps. Lyon is in the Rhône-Alpes region and towards the end of my stay in 2013 I realised I had, rather embarrassingly, been nowhere near the Alps. I mapped out this trip but it never got off the ground due to a lack of time/willing friends. Fast forward to three weeks ago when I realised I had zero plans to take advantage of my upcoming two-week break and back it came off the shelf. Luckily this time I found two willing companions, Charlotte (English) and Julia (Austrian). 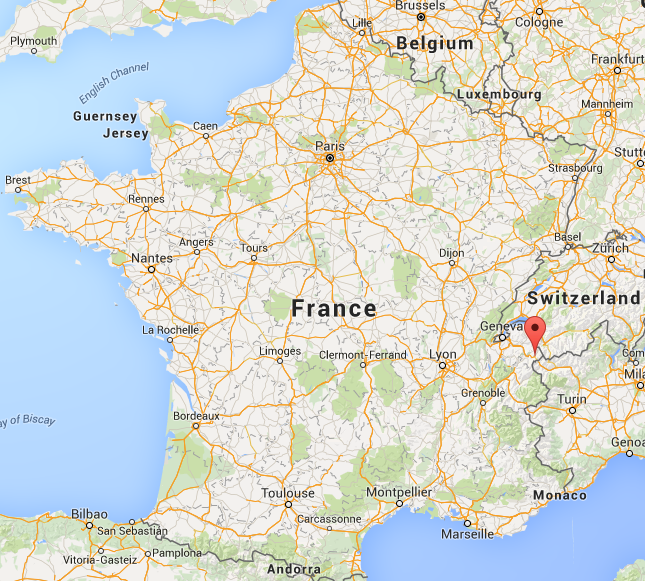 Chamonix is located right at the foot of Mont Blanc, a little over two hours from Lyon by car. The train service on the other hand takes around five hours on three different trains, so we opted for blablacar/carpooling. 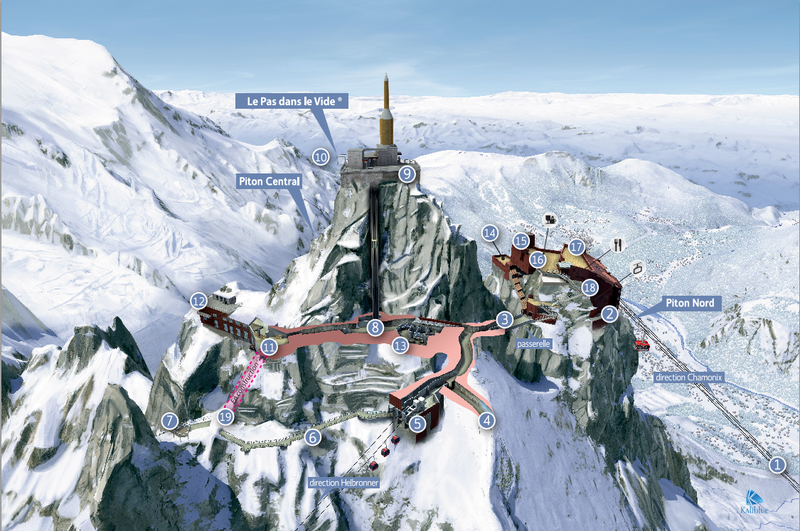 Chamonix is a hotspot for skiing in the winter, and other outdoor activities during the summer. Visiting in the off-season meant we avoided the crowds, and luckily we had perfect weather the whole time! In the end we spent around five hours at the top. This did involve some stalling due to the fact that the lift to the very top was out of action for a while. However, there was plenty to keep us occupied – the infrastructure on this sheer rock face was seriously impressive! There were multiple viewing platforms looking out in all directions, and an exhibition about extreme alpine sports – each video was a bigger ‘NOPE’ than the last. What was interesting was that we didn’t notice the altitude at all while rapidly ascending thousands of metres in the cable car, or roaming around on the platforms, but if I accidentally headed up a flight of stairs a bit too enthusiastically I immediately regretted it. Just felt slightly woozy and not in control of my own brain. I guess that’s it for my mountaineering career then, quel dommage. The Aiguille du Midi was the one thing I was really wanting to do, so for the following two days we just did a couple of light walks. The first was to the Mer de Glace, France’s largest glacier. Unfortunately, like many glaciers this one is on the retreat and a shadow of its former self – though it is worth noting that part of this can be attributed to the season, as snow has not yet had the chance to accumulate. The walk was really cool, with the scenery changing quite rapidly from forest to much more, well, alpine scenery as we got to the valley. There is also a train that accesses the top of the valley, with a cafe, souvenir shop and small hotel. There is also an unassuming looking little stone building that houses the ‘glaciorium’ – an impressive multimedia exhibition about glaciers. Very informative and I was quite pleased to have actually remembered some info from our visit to Fox Glacier earlier this year! We took a different route back down which was unremarkable compared to the boulders on the ascent. The final day saw one more short walk to see the Glacier des Bossons – unfortunately our timing made it very hard to get a good photo with the sun. This was made up for by the fact that our lunch stop was filled with the CUTEST CHILDREN EVER – think puffer jackets and walking boots, mittens hanging off their wrists, mini walking sticks and super cool sunglasses – and of course babbling away in baby French. Our final afternoon was spent chilling in the hostel’s hammocks/hot tub, and wandering round the village. I went to the Alpine museum which was small but modern and a good introduction to the history of mountaineering in the region. For example, Mont Blanc is Europe’s highest peak but clearly not the most difficult to climb, as it was first ascended in 1786, compared to Switzerland’s Matterhorn which was not successfully summited until 1865 (which ultimately proved fatal to half the party, a disaster which marked the end of the ‘Golden Age of Alpinism’ of the previous 11 years). The second half of the exhibition was all about artworks produced by mountaineers – firstly on scientific expeditions, and later enjoying the mountains in their own right – which I like to think added to my overall finding-relevance-for-my-degree tally. The second week of the holidays was spent just chilling in Lyon, and for the latter half I had my first official visitor – Erin, from home, halfway through a seven week round-the-world trip. We took a very relaxed approach to exploring the centre of Lyon and its tourist essentials such as the old town – as well as the lesser known gems of Primark and Ikea (don’t ask…). Special highlights included a fancy meal out chez Paul Bocuse (classic), and frolicking in the autumn leaves at the Parc de la Tête d’Or, and most importantly fulfilling another long-held (but impractical) ambition of mine to buy a rotisserie chicken and drippings-covered potatoes from the market. Thankfully, we were not disappointed! Erin’s visit fortunately coincided with the Rugby World Cup final, and this time I managed to amass a slightly less peer pressured group of supporters – two Kiwis, three Frenchies and one très enthusiastic American. As far as we could tell we were the only actual Kiwis there, but there were several supporters in various All Blacks tops and a few Aussies, and the bar was soon packed. Luckily we had turned up super early and secured the prime spot in front of the big screen, though this didn’t help us when a power surge cut the connection right before kickoff! Thankfully we didn’t miss anything too exciting. It was a tense game though, not helped by the fact that we couldn’t tell who anyone else was supporting – the cheers for Australia seemed to rapidly increase – but we decided the French people were generally unfussed and just supporting good play. For a country that supposedly doesn’t do Halloween, the decorations in the bar were incredible, as were the staff costumes (and free tray of lollies we got). Sadly I didn’t get any decent photos, but the giant alien pulling the finger in the general direction of the Aussie supporters was a highlight. There were also quite a lot of kids and adults roaming the streets in costume, and going into shops/restaurants to trick or treat? Apparently this is normal. It was an appropriately exciting evening in any case! As per, will next write when there’s a few worthwhile reasons to do so. November is a blank canvas at this point.